Kakamega High School’s Green Commandos will take on Central Region’s Olbolosat High School in the final of the Kenya Secondary School Sports Association (KSSSA) Term 2B Games on Saturday morning after both sides won their respective semi final games on Friday. 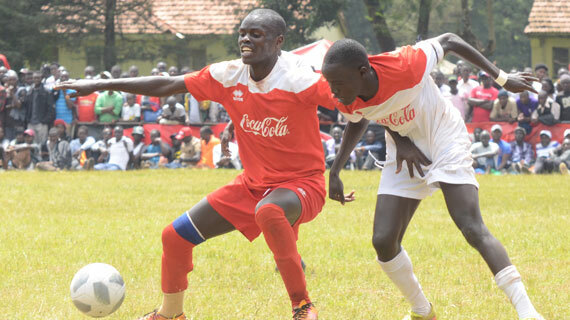 Olbolosat produced the tournament’s shocker, beating favorites St. Anthony 2-0 while Kakamega needed penalties to edge out a stubborn Dagoretti High School 4-3 after a barren stalemate in regulation and extra time. Kakamega failed to reach the final last year after losing to eventual champions Upper Hill High School in the semis and this year, head coach Brendan Mwinamo has vowed they will do their best to lift the trophy. “We are more experienced now because we learnt from our mistakes and also, playing in the National Super League has really boosted our confidence. The semis match was very tough but I think it showed the best of us,” Mwinamo said after the match. On penalties, Kakamega didn’t have the best of starts as Boniface Ooko struck his effort into the post just after Dagoretti had scored through Simon Omondi. However, Dagoretti could not ride on the advantage as skipper James Peter sent his effort wide despite sending the keeper the wrong way. Kakamega were back into the game and they did not waste their new lease of life, Evans Odhiambo and Joshua Otieno scoring their next two. Shabaan Machozi scored for Dagoretti, but teammate Joshua Onyango took a lame effort easily saved by the Kakamega keeper to swing the advantage back to the Green Commandos.Henry Atola took Kakamega 3-2 up with a well struck low effort to swing the pressure burner to Dagoretti’s corner, but Gilbert Omondi eased it scoring their final kick. Pressure now was on Kakamega skipper Alpha Onyango and the Dagoretti keeper heading into the final kick. All Alpha needed to do was score and send his team to the final and he didn’t falter, striking a cool penalty in the heat of pressure. Dagoretti were unlucky in the 120 minutes of play as they struck the post thrice. In the second half, Kakamega were almost punished in the 67th minute when Alpha lost the ball cheaply in midfield, Finlay Osorio picking up and driving into the box but his shot came off the upright. Five minutes to the end of the regulation 90 minutes, Dagoretti came close again with Mwachozi’s snap shot from range coming off the crossbar. Dagoretti hit the crossbar once again late in added time when Osorio broke through off a counter to shoot low on the right. Meanwhile in the girls’ category, Kwale Girls will meet Archbishop Njenga in the final after beating Nyanza’s Kobala 3-2 in an entertaining but tense tie. In the other semi, Arch Bishop Njenga sailed to the final with a 2-0 win over Nginda Girls, Violet Wanyonyi and Brenda Masibo scoring the important goals in either half. In the Under-16 Copa Cocacola category, Rift Valley’s St. Antony will clash with Western Region’s St. Peters Boys Mumias in the final. In the semi-finals played at the Hill School in Eldoret on Friday morning, title favorites St. Antony were in a class of their own beating Riyabu from Nyanza 5-0 while St. Peters needed a late winner to crush the hearts of Upper Hill winning 2-1 in a highly competitive game. Elsewhere, Laiser Hill were crowned Rugby Sevens champions after edging out Chavakali 26-5 in the final played at the Eldoret Sports Club. Clinton Kioko’s brace of tries complemented with one each from Daniel Kisakyamukama and Branson Madigu handed the Nairobi region champions the title. Laiser Hill and Chavakali both qualified for the East Africa School Games which will be held in Rwanda next month and will be joined by St.Peter's Mumias who finished third after beating Dagoretti 24-7 in the play-off.